Quain'tana Val Sarghress is the founder and current Ill'haress of the Val'Sarghress clan. She is a capable warrior and a figurehead for the common class. She is the biological mother of Kel'noz, Mel'arnach and Laele'aell, and has adopted Syphile, Koil'dorath and Ariel as daughters. Ariel is actually Quain'tana's granddaughter. Quain'tana built the Sarghress clan from the ground up, and many feel that if she were to die, the clan would collapse in her absence. She spent most of Arc I off of the battlefield in search of an appropriate heir to replace her if she fell. After exploring her available options, she became desperate and stole Mel'arnach's baby girl (Ariel) to raise as her own daughter. Though she is harsh, distant, and demanding, Ariel accepts Quain'tana as her mother. Quain'tana fights for the rights of the commoners and has been slowly pushing against the ruling class for centuries. 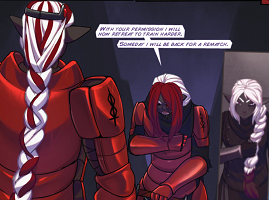 As of Arc II, Quain'tana is leading an official Val'Sarghress assault on the Vel'Sharen clan. Quain'tana Val'Sarghress is a warrior who believes in the importance of strength, both of spirit and of body. She is known to be pragmatic, stubborn and insensitive. She does what she thinks is right for the clan without question, and will never give up without a fight. Her posture and personality are both commanding and authoritative. She is a firm leader who will do anything that it takes to win the wars she wages. Quain'tana lives for the battlefield and freely admits that she has no head for politics. Her short temper, harsh policies, and extremist views have cause many to label her as a tyrant, but to a growing number of commoner drow, she is seen as a courageous warrior who will fight relentlessly for justice. Due to her rough personality, she does not have many people she would consider close to her. She trusts her Commanders as friends in the field, but there very few people that seem to be able to appeal to Quain'tana on a personal level. Her son Kel'noz is often able to calm her down and give her guidance when she needs it, and she is rumored to be lovers with Ash'waren Val'Sullisin'rune, the Ill'haress of the Sullisin'rune clan. She is respected by her daughter and heir, Ariel Val'Sarghress, but is loathed by her older daughter Mel'arnach, with whom Quain'tana has had a history of abuse. Quain'tana is arguably one of the tallest drow in Chel'el'Sussoloth. She is a strong, muscular and imposing figure who is rarely seen outside of her battle dress. She has long white hair that is streaked with red dye and has purple eyes. Quain'tana was born a commoner in Chel'el'Sussoloth. Seeing the rough lives lived on the streets outside of the golden Val palaces, she began to fight back against the nobility. Starting slowly, she built up a group of mercenaries to change her lot in life. As this ragtag group took shape, it formed the foundations of what would later become the Sarghress Clan. Eventually, this clan became strong enough to be considered for Major Clan status. With the backing of the Val'Sullisin'rune, the Sarghress attained Val stuatus, and Quain'tana became its Ill'haress. This angered the many traditionalist Val, most of all the Val'Sharen who saw Quain'tana's commoner status as a disturbance to the stable yet fragile order that currently held sway in the city. When Chel'el'Sussoloth fell prey to the Nidraa'chal menace, Quain'tana and the Sarghress clan refused to help the Val'Sharen hold the peace, choosing instead to defend commoner districts and their own borders. When the war was over, the Sarghress held the lands they had protected and took advantage of the weakened state of the Val'Sharen empire to acquire territories the Sharen could no longer hold. This sudden growth led Quain'tana to assign commoners as district administrators, causing public outcry from Vals of other clans. As Ill'haress of the Sarghress clan, Quain'tana has had to step back from fighting on the front lines and hold the clan together. Too critical to the clan, most believed that if Quain were to die that the Sarghress would not stay unified without a clear line of succession. Quain understood this and despite her public disdain for the traditions of the past, one tradition that Quain privately hoped to continue was to have one of her daughters lead the clan after her. At this point, Quain'tana had three children - twins Mel'arnach and Kel'noz, and a daughter Laele'aell. Her womb was critically wounded by Sarv'swati Vel'Sharen in battle, rendering any hopes for future children futile. Mel'arnach had no interest in ruling the clan, leaving Laele'aell as the only viable female candidate. Unfortunately, Laele'aell soon fell to a demon and became unfit to lead the clan. Without a suitable heir, Quain'tana ordered Mel'arnach to bear a daughter to lead the clan. Mel'arnach refused, citing a firm distaste for mating with males. With no other choice for obtaining a blood heir, a furious Quain'tana imprisoned Mel'arnach for disobeying orders. Quain'tana was forced to look to other sources for a worthy heir. She first adopted a baby named Syphile from two strong parents. Quain'tana charged her to become a summoner at Orthorbbae, but after undergoing the mandatory tainting ceremony, Quain'tana stripped her of her heir status for being too weak to resist what she considered Vel'Sharen treachery. With no other options, she adopted a trusted commander and friend, Koil'dorath Nori'fu Sarghress, as her official heir. Meanwhile, the imprisioned Mel'arnach began efforts to conceive a child of her own with Zhor, an Aware spider she kept as a lover. When the baby was born female, Quain'tana immediately forced Mel to surrender the child. She named her Ariel, declared her publicly as her own daughter and placed responsibility for her development entirely on Syphile's shoulders. Quain'tana was extremely distant during Ariel's childhood, leaving her care entirely to Syphile's discretion. After years of Syphile's abusive care, Ariel had grown weak, angry, and shy. She remained so distant from Ariel that she did not even recognize the child when she was brought before her for review upon Ariel's tenth birthday. As Kel'noz reminded Quain'tana of the girl's identity and reason for her presence, Quain'tana dismissed the merchants she had been meeting with. The mighty Ill'haress then examined her potential heir, asking the child to name her greatest desire. As Ariel eagerly blurted out her desire to kill Syphile, Quain'tana smiled with approval. However, this approval quickly faded as Ariel proved far too timid to even attempt to carry out her desire, making numerous excuses for herself. Admonishing Syphile for her failure, she declared Ariel too weak to serve as her heir, refusing to acknowledge the child as her daughter. After Ariel fled the room, Kel'noz furiously turned on Syphile, revealing the younger Val's shamefully inept teaching methods. Quain'tana quickly reconsidered the situation, leveling Ariel's faults solely at Syphile's feet. As Kel'noz began to propose alternate forms of education for the young girl, Quain'tana dismissed the possibility of having a female of the clan's houses tutor Ariel, noting the temptation to manipulate the girl to their own ends. Kel'noz then made the suggestion of educating the girl himself, noting the practice of male tutoring to be relatively common among the common people. He further suggested that he might take Ariel with him to Orthorbbae, though he agreed that she would have to be hidden from Snadhya'rune, the school's headmistress. Though hesitant, Quain'tana agreed to his unorthodox plan. Quain'tana orders Ariel and her cousin Sar'nel to fight to the death. Inevitably Ariel's identity was discovered at school, and Ariel returned to the fortress. Quain'tana told Ariel that she would need to prove herself in order to become heir to the clan and charged her with taking revenge on the boy who bullied her throughout school. Ariel obliged and brought a defeated Mir'kiin Vel'Vloz'ress to Quain'tana's feet. Quain'tana then ordered a frightened Ariel to kill the boy. When Ariel refused, she cited Ariel's previous desire to kill Syphile. Angered, she asked if Ariel would prefer to kill only those in her own clan. Quain ordered Ariel's same-aged cousin, Sar'nel Tions Sarghress to fight Ariel to the death if that was the case. Ariel chose to show her mother her strength by killing Mir'kiin gruesomely on the spot. Quain'tana immediately declared Ariel as her heir to the Sarghress clan. Quain'tana meanwhile kept Mel'arnach in captivity, refusing to allow her anywhere near Ariel. A broken-hearted Mel'arnach attempted to attack Quain'tana, but was restrained as Quain'tana struck her square in the face. Syphile, meanwhile, continued to be a disappointment to the clan. One one notable occasion, she directly favored the orders of Zala'ess Vel'Sharen over those of Quain'tana herself, prompting the Ill'haress to angrily warn Syphile that she was on thin ice. Later that day while walking down the halls and conversing with some of her Dev'esses, Quain'tana found Syphile beaten and sobbing at the bottom of a flight of stairs and banished her from the Sarghress clan. Quain'tana prepares to break Mel'arnach's arms. With an official heir of her own blood, Quain'tana began to gather the clan's strength to plot the demise of the Vel'Sharen. With war between the Val'Sarghress and the Vel'Sharen slowly simmering to a boil, Zala'ess Vel'Sharen struck the first blow by failing to invite Quain'tana to a gathering of the clans' Ill'haresses. She sent a massive war golem and a trained nether summoner in place of an invitation, which the Sarghress soldiers fought off handily. In the confusion of the attack, Quain'tana found that Syphile had returned to the clan as a Vel'Sharen agent with the goal of assassinating Ill'haress Quain'tana. Quain'tana deftly defeated Syphile with nothing but her bare hands, killing the traitor once and for all. Before she died, Syphile spat out a series of insults to the woman who raised her. She cursed Quain'tana, calling her a terrible mother who ruins the lives of anyone she gets near. She blamed Quain'tana for all the misery she had suffered and for ending up the way she did. Her last words before Quain'tana stabbed her through the neck were "Go ahead Mother, do what you do best. Do the only thing you know." In the wake of the attack, Quain'tana was visited by Ill'haress Ash'waren Val'Sullisin'rune, who attempted to soothe Quain'tana's bruised ego. She informs Quain'tana that Zala'ess used the gathering as a means to accuse the Sarghress clan of being behind the Nidraa'chal uprising with mixed results among the other Ill'haresses in attendance. With the Sharen position made public, Quain'tana realized it was time to wage war. With Syphile's final words still ringing in her ears, she began to open up to Ariel. She went on a wolf ride with her heir to show her the Sarghress war machine and to explain her philosophy. She also made an effort to show Ariel how proud she is of all that she has accomplished. Meanwhile, Mel'arnach had taken advantage of the attack to sneak off to visit her lover, Snadhya'rune Vel'Sharen. Upon her return, she was thrown at Quain'tana's feet. Quain'tana demanded an explanation, to which Mel'arnach simply asked for another chance. Quain'tana requested more children of Mel'arnach to solidify her bloodline in the clan. Mel refused, and Quain'tana ordered that Mel'arnach's arms be broken as punishment. When Mel spat that Quain should do her own dirty work, Quain'tana obliged, smashing her daughter's arms to a pulp with a warhammer. Mel'arnach was thrown in the dungeon, where she soon met with Ariel. She told Ariel that she is her real mother, and that Quain'tana took Ariel away the moment she was born. Torn between her two "mothers," Ariel brought Quain'tana to Mel'arnach to ask that Mel be given another chance. Mel'arnach agreed to Quain'tana's strict demands, and began the process of bearing children for the clan. 15 years later, Quain'tana is reported to be in the heart of battle with the Vel'Sharen. She successfully lead her troops in the assault on First Landing, and then the final push on the Val'sharess tower itself. After the capture of First Landing, Quain'tana seemingly begrudges Ariel for acting out of line during the push for Darya Lake, she gives the order for Ariel and her party to be sent to the surface to train as highland raiders. After taking First Landing, Quain'tana met with Ash'waren, who begged her to end the war with the Vel'Sharen before an assassin could get the best of her. Taking the empath's advice, Quain'tana sent Koil'dorath to deliver terms of surrender to the remaining Vel'Sharen who had taken shelter in the Vel'Sharen Fortress. In response, the Sharen sent Sab'rror as their envoy; in exchange for letting the remaining Vel'Sharen leave peacefully, she would have control of Chel and their lands. When Quain'tana commented that Chel was not his to give, he replied that she never changed - if she would hold her attack, he would lead her to Zala'ess in order to negotiate. True to his word, Sabrorr led Quain'tana to Zala'ess' encampment at the Vel'Vloz'ress Fortress. Unimpressed with Zala'ess' attempt to put on an intimidating display of status, Quain'tana proclaimed that the same council chamber where the Empress had plotted her death was now hers, as was the body left within the chamber - that of the Empress Diva'ratrika. During the parley, a member of Zala'ess' alliance from the Balvhakara clan attempted to intimidate Quain'tana by crashing a war-golem cannon through the roof of the negotiation chamber and aiming it at the Val'Sarghress leader and her bodyguards, who pointed out that the last golem sent against them was now a "door decoration." Zala'ess and Quain'tana continued to posture at each other, refusing to back down. As they parleyed, Zala'ess drew on nether mana in an attempt to show another display of her power, but was stopped by Quain'tana taking hold of her lower face and squeezing until Zala relented. Afterwards, Zala'ess regained her composure, offering Quain'tana a drink. Quain'tana refused, stating that the though of drinking with a Sharen spoiled it. As they continued to come to terms regarding Chel's control, the ground began to shake, announcing the arrival of Kiel'ndia and her crew atop the giant turtle summon. While riding to investigate the source of the demons, Quain'tana was attacked by her own bodyguards. Forced to kill their wolves and fight them off, she was able to evade her own troops long enough to join Zala'ess, who was also fighting off her own soldiers and bodyguards. Quain'tana encouraged her to keep fighting, until finally the surrounding drow collapsed like puppets with cut strings. Encouraging her to trust in her warriors, Quain'tana raised her hand with Zala'ess' to throw up a mana flare, signalling their forces to counter-attack the giant demon that had appeared from the Vel'Vlozress fortress. Quain'tana faces off against Sarv'swati Vel'Sharen in a final duel of honor. As soon as they stopped to catch their breath and recover from the incident, Quain'tana was challenged to a duel by Sarv'swati. Agreeing to fight her in one-on-one combat, Quaintana ignored Zala'ess attempts to convince her otherwise, telling her that a victory of will and strength was what their people needed to see. 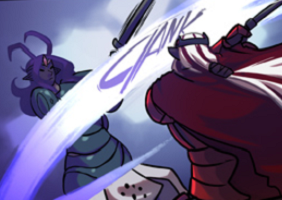 During the fight, Quain'tana noticed that Sarv'swati's blade was coated with poison. Unable to completely dodge every attack, Quain'tana tooka small cut to the cheek - enough to be infected with Snadhya'rune's mind-altering poison. The duel was finally concluded as Zala'ess discretely assisted Quain'tana, catching Sarv'swati's foot with a small amount of earth and tripping her long enough for Quain'tana to strike a fatal blow to her head. Brushing off Zala'ess' offer to have her seen by the Vel'Sharen healers due to the increase in poisonings recently, Quain'tana told her that she had her own healers - the recent events were all the more reason to not trust the Sharen blood arts. After the Puppeteer Incident, Quain'tana and the legion commanders met once again to discuss strategy now that the District War had been brought to a tentative peace. They were joined by Sil'lice Val'Sharen, who had returned from her mission to recruit the Kavahini Clan. The Sharen renegade reported that their venture had failed due to their forces being split prematurely, resulting in their inability to take Felde from Snadhya'rune. Suu'be advised that Koil'dorath could depart within a week at the head of a legion to end the conflict with the First Daughter. Mimaneid's status was an ally was unconfirmed, as their leader had been injured in the assault and the Sharen forces were unsure where they stood now. Quain'tana commented that this matched what the clan knew, as every clan in the alliance had had members in attendance. Suu'be commented that her "brat" had been in attendance as well. When Sil'lice was told that they had made peace with Zala'ess, she told the assembled leadership that it was a mistake, to which Suu'be agreed, commenting that she had been trying to convince Quain'tana of the same thing. Sil'lice responded by telling Quain'tana that if she didn't have the guts to kill Zala'ess herself, then she would do the deed instead, Quain'tana angrily replied that if she did, then Quain would kill her herself, and to not endanger the alliance until she gave the order to strike. Quain'tana then ordered Suu'be to provide her with two hundred of the Home Guard to assist with the attack on Snadhya'rune's tower in Chel, under Sang's command, silencing Sil'lice's complaints by telling her that she would take them and like them. Quain'tana sees a bit of Laelle's strength in Ariel. The next day, Quain'tana arranged a sparring match with Quill'yate, followed by one with her heir, Ariel. After being defeated by the Ill'haress, Quill'yate commented that the healers appeared to have done a poor job treating her wound. Quain'tana replied that she had had it checked multiple times, and that there was no way she would allow Zala'ess' healers anywhere near her face. While their own healers appeared to be incompetent, at least they could be trusted. Amused by her perseverance, Quain continued to provide comments and advice, attempting to teach her heir valuable wisdom. When Ariel asked her how to defeat an opponent who was too strong, Quain'tana told her to fall back and wait for a better opportunity. When asked what to do if she couldn't retreat, she stated that Ariel had better outlast her foes. After the match ended, Ariel asked her permission to retreat in order to train harder, and one day return for a rematch. Quain'tana agreed, seeing a memory of Laelle in Ariel as the younger drow left the sparring arena. Quain'tana confides in Ariel about her recent frustrations, especially how much pain she is in. 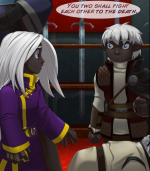 When Quain'tana turned to face her heir, the younger drow paused in shock at the advancement of the wound on Quain'tana's face, which she claimed hurt badly - a bottle in the face did more to dull the pain than the healers had. After agreeing with Ariel's suggestion to summon a different healer, she revealed that she had already sent for healers from the Val'Sullisinrune, who would arrive the next day. In the meantime, Quain'tana asked how Ariel felt regarding the children, noting that she thought Ariel had taken a liking to them, Ariel agreed. She then told Ariel that they were now her responsibility and to use only people she trusted with their care, and that Ariel herself was not to leave the fortress until the current matters were concluded. The next day, the healer arrived and began another attempt to treat Quain'tana's wound. After the first try, Quain'tana left the healing room, stepping outside in time to hear Suu'be again berating Ariel. 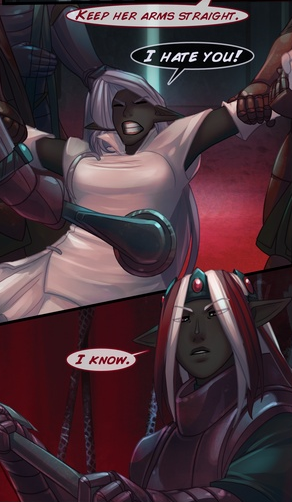 With her paranoia in full swing, Quain'tana challenged Suu'be, accusing her of trying to replace her. She began to savagely beat the legion commander, pausing when Koil'dorath attempted to convince her that Suu'be was loyal. Quain'tana hesitated, listening to Koil, when Suu'be reached up and clutched at her injured face. This incited a second round of renewed anger and punching, only to be stopped by Koil'dorath's pleas. The Ill'haress finally relented, telling Suu'be that she would kill her before she died, as well as any who plotted behind her back. Suu'be was moved into the healing room to have her wounds treated. Sang stepped in, ordering that the majority of the legions be taken out for field exercises and for Ariel to seek out additional healers who could stand a "little tap to the cheek." In the meantime, Quain'tana ordered the Val'Sullisinrune healer to cut the decayed flesh from her face - do what she must, and quickly. 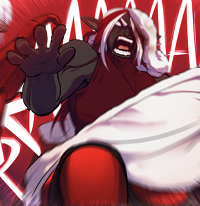 Quain'tana flies into another berserker rage. The healer picked up where she had left off from the next morning, this time with three empaths attempting to assist her. The pain of the operation was too great for the empaths to counter, however, and the healer ordered them out of the room. As the left the room, the healer informed Quain that her left eye would need to be removed; Quain'tana ordered her to do what she needed to, but refused the sedative that the healer attempted to give her. When the healer protested, arguing that she could not safely perform the operation without it, the Ill'haress again refused it, stating that she would not be injected with any drugs and ordered her bodyguards to remove the healer. To her surprise, however, Angjss'stra and Zith instead attempted to restrain her, telling her that it was for her own good while the healer attempted to give her the sedative. More Dragonslayers attempted to enter, having been alerted by the noise. They were met with an enraged Quain'tana, who proceeded to cut a swath through her own guardsmen on her way out of the healing area. Putting the recent events together - the healer's actions, the mutiny of her trips, the poison, and Vene's assassination - Quain'tana focused her ire on Suu'be alone, feeling that she was behind all of the recent trouble. Calling the Home Guard commander a traitor, she attempted again to fight her way through her troopers, who were attempting to convince her to stand down. Quain'tana's last words to her daughter. Mandroga stepped between the two, ordering that Quain'tana be sealed in stone, which barely halted the Ill'haress due to her unusual resistance to mana arts. This act of perceived treachery only served to further her anger. Taking cover behind a pillar with Faen and the remaining grandchildren, she refused to surrender, dodging additional crossbow bolts that appeared to be aimed at her and the children. Telling Faen to stay put, she moved forward, killing two wolves and a golem trooper who had been sent to flank her. Resisting or dodging additional attempts to stop her with fire and earth mana arts, she continued to charge forward, determined to take Suu'be down with her. Quain'tana was met by several crossbow bolts to the chest, slowing her charge down. Finally, she and Suu'be crossed blades, with her sword cracking and shattering as Suu'be parried the blow. Suu'be was poised to strike down Quain'tana, stating that "Legends are better dead," when Ariel, Rosof and other members of the Tions house arrived, hoping to convince Quain'tana to see reason. When a crossbow bolt missed Ariel's head as she attempted to reason with Suu'be, Quain'tana stood again, as if to protect her daughter. Still seeing Suu'be as the main threat, she reached out and snapped Suu'be's neck, taking a fatal blow to the midsection from the Home Guard commander's sword in the process. Quain'tana was taken to the healers once again in a last ditch effort to save the Ill'haress' life, but they were unsuccessful in the end, and Quain'tana succumbed to her wounds, leaving Ariel as the new Ill'haress of the Val'Sarghress clan. "You did well, my daughter...It's the first one that is the most difficult. You need to be ruthless to survive." - Quain'tana's words to Ariel after the latter kills Miir'kin Vel'Vloz'ress. "...Quain'tana is a woman who has fought against her fate, against society, and impossible odds her whole life. What did you expect her to do, just give in to the stubborness of her rebel daughter?" - Kel'noz, speaking to Mel. "Trust in your warriors. That is what a leader does. They will answer our call." - To Zala'ess Vel'Sharen, signalling their clans to counter-attack the demon god. "Be careful. Chasing headlong into danger, you might miss the enemy behind you." - To Ariel Val'Sarghress, during their sparring match. "Endurance is one way to face a stronger foe. Exhaust your enemy. Make her want to give up before you do. Make the victory cost her dearly. Some will cut their losses and quit. Some will be taken down by your allies while you keep them distracted. Some...Some are just too strong." - To Ariel Val'Sarghress, attempting to impart battle wisdom during their spar. "I'll kill you before I die, I swear. All of you, who plot behind my back. You will not survive my passing." - To Suu'be Nori'fu Sarghress, thinking that the commander was plotting to replace her. Concept sketch of Quain'tana and Nimael (Machike Conquest Side-story).